With the clay Population around in Rows. The clay remembers. It remembers what you do to it. This quality of remembering comes from the fact that clay particles have a flat plate-like shape and lie on top of each other. How you squeeze it, roll it or flatten it aligns, realigns or distorts the matrix of particles beneath the surface of the clay. When the clay dries and is fired, this memory is made apparent. Hence the teapot-maker cuts the opening of the spout at an angle, because she knows that in the drying, the spout will unwind. The coil-potter takes care to scrape and blend each coil of the pot for fear of them popping out and showing after firing. So as the maker works on the visible outer form of the object, she must always imagine how her hands are affecting the invisible inner workings of the clay. This memory also means that the maker cannot fully bend the material to her will. She has to negotiate how it gives and resists: to be careful to how it could warp or crack. She must compensate for shrinkage and possible collapse in the kiln. This material has a given nature and the maker is no god-like agent with powers to manipulate at will. Instead, the clay invites her into a journey of negotiation: one where she has to balance the vision of what she would like to produce with what the clay will allow her to do and the skill that she has. 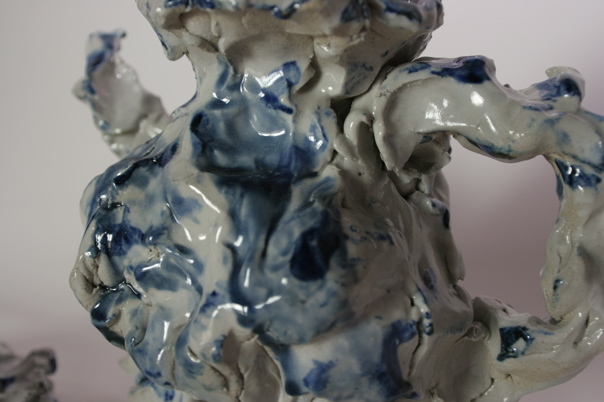 How she negotiates or bumps up against the ‘personality’ of the clay is through failure: structures collapse under their own weight, cracks form from uneven drying, glazes shell or crawl in a firing. The maker enters a journey of trial and error. She plans, makes, fails, learns, re-plans, re-makes, re-fails, re-learns. But this journey of bumps and crashes is a dangerous one because each crash leads not only to a re-evaluation of the intended plan or task, but a re-evaluation of the maker as subject. What an artist or designer brings to the clay is more than skill or a planned outcome. She produces from some unique perspective or from who she is. In making, she is not simply replicating an object. She makes from the material of her own subjecthood, and attempts to impute or imbue something of herself into the work. But the resulting work is not a straightforward mirror reflection of the maker. In the negotiation between the maker (as subject) and the material, the work transmutes, translates, or transmorphs what the maker offers to it. If what the maker offers is herself as subject – her own subjective materiality – then what is transformed through the clay is the subject herself. Hegel describes this as a journey of consciousness where the encounter with the material, or ‘bumping into’, reverberates back into and through the subject. [i] These reverberations prompt a revision of the maker’s consciousness, threatening her subjecthood with self-annihilation. But each crash represents a cumulative milestone where the maker is able to ‘always reassemble [herself], prepare a new scene, enter the stage armed with a new set of ontological insights – and fail again’. [ii] As such, tests or attempts that go wrong in the studio not only provide a revision of technical knowledge but also a reassessment of the maker’s ontological position in relation to the material and to herself. As the maker puts hand to clay, there is a kind of journey that material practice invites her onto. Clay is the travelling companion, but also the road on which the maker travels. The material has a quality that engages and challenges the subject-maker’s consciousness. It demands a negotiation of how the maker remembers because it remembers. In attempting to control processes of drying, firing, and cooling, it reconfigures the maker’s perception of time because she accumulates within her a sense of the material’s own time and rhythms. So with each new creative demand from the maker, there comes a counter-demand from the material. The route of the creative journey is described by milestones that mark spots where the maker’s consciousness has bumped against and crashed into the nature of the material. In this journey of consciousness, it is the object she is attempting to create that is also creating her, transforming the positions of subject and object, maker and material, potter and pot. This entry was posted in Objects on July 11, 2010 by jacktan.